Unsure on how to measure and describe your flighting to us? Don’t worry, you’re not the first person!! 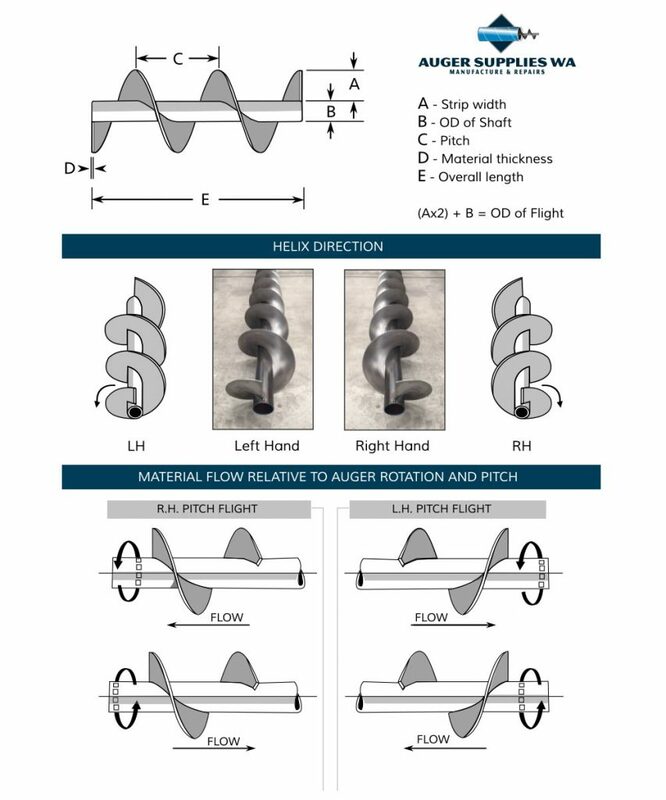 We have put together this handy reference (with notes below) to help you measure your flighting correctly, and in particular figure out whether you require a Right Hand or Left Hand Helix. OD x Pitch x ID x Thickness x Hand. is equal to the shaft diameter plus twice the strip width (inside edge to outside edge) of the flighting. If the flighting comes out of a barrel we will want to know what the barrel outer diameter is. of flighting can be produced to any measurement but is usually made to fit the OD of CHS pipe sizes of (in millimetres) – 21.3, 26.9, 33.7, 42.4, 48.3, 60.3, 76.1, 88.9, 101.6, and 114.3.
is referred to as being either left or right hand. If you are unsure how to work this out then picture the flighting as a bolt thread. If you would thread a nut on in a clockwise direction then it is right hand flight. A length of flighting can only be of one helix direction and looking at it from the other end or turning it around makes no difference. Continuous Flighting comes in varying thicknesses and is named after the thickness of the steel strip it is made from. The common thickness sizes are 3, 3.5, 4, 5, 6 and 8mm but can be manufactured up to 15mm. Due to the manufacturing process, when formed the outer edge of the flighting ends up approximately half of the original thickness. For example – 5mm flighting will measure approx 2.5mm on outer edge. If you measure your Flighting on the outer edge (difficult to do if it has worn paper thin!) and double the measurement it will give you an idea as to the original thickness. Segmented flights are made from Plate Sheet and are the same thickness from inner to outer edge. The most common thicknesses are 3mm & 5mm, but segments can be made up to 40mm thick if the plate is available. is the distance between flites. Measure this along the centreline of the shaft from the outer edge of one flight to the next flight. The pitch dictates how far the product will move in one shaft revolution. For maximum economy the pitch on spiral flighting normally equals the outside diameter of the flighting and in this case is termed square pitch. Square pitch will usually be the most efficient flighting where a variety of working angles might be encountered. For set angles of elevation a less than square pitch might work better. Pitches that are less than two thirds, or more than one and a half times the outer diameter, should be avoided. The greater the pitch the more volume you will move for the same shaft rotation. You should measure the pitch if you are contemplating repairing just a section of an auger as different pitches might not function correctly together. Old augers quite often have flighting of less than square pitch and if you cannot obtain a near similar pitch to what is already fitted, then flighting of larger pitch should be fitted on the discharge end of the auger, not at the intake end. Should you be tempted to increase the pitch of your auger to increase flow rate you need to be aware that more power will also be required to rotate the auger. is where two lines of flighting are fitted at the exposed pickup end of the auger starting at 180 degrees from each other. It usually finishes just up inside the barrel. Although it might give the impression of a half pitch, double starting does not vary the pitch. Depending on the RPM of the auger and the material being moved, it might or might not improve auger efficiency. is the length of flighting exposed at the pickup end of the auger. A choke length equal to one pitch is adequate for augers rotating at slow RPM. As rotational speed increases the grain needs more time to feed into the spiral gap of the flighting. As a general guideline most augers have two pitches exposed. A sliding cover (generally called a “choke”) can be fitted to allow the choke length to be varied. of an auger will decrease as the angle of elevation increases. An auger will still work at 90 degree elevation but efficiency will be less than 40% of that of a horizontal auger. If you are unsure of what you want in the way of flighting then it is a good idea to mention the barrel size or the machine type the flighting comes out of. Saying you want 8” flighting when what you really want is flighting to fit an 8” barrel. Saying you want flighting to fit on a 1” shaft when what you mean is flighting to fit pipe that has a 1” bore. Getting this centre correct is important – you need to know what the outer diameter of the shaft is. A rough guess can create problems. Get the hand correct – otherwise you’ll be “sucking instead of blowing”!